I can’t remember the last comic book I’ve been looking forward to as much as the first issue of Velvet. Ed Brubaker and Steve Epting worked together on the terrific Captain America: The Winter Soldier (the source material for next year’s Cap movie), where they successfully resurrected the long-untouchable dead character Bucky Barnes. Brubaker writes a lot of nourish comics, but Cap was more in the style of espionage thrillers, much like my hitherto-favorite work of his, Sleeper. Epting, meanwhile, has grown from an artist doing work that felt a little out-of-place following George Perez’ run on The Avengers to an outstanding artist who mixed in with Butch Guice and Michael Lark on Cap. 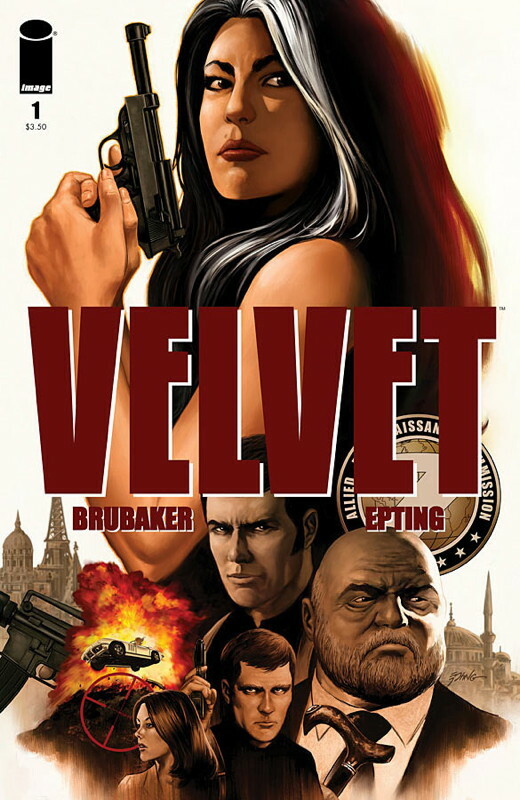 So the creative team is great, and I was completely sold on the premise of Velvet as soon as a read a preview: Velvet Templeton is the secretary to the director of ARC-7, a top-secret British intelligence agency. But it’s not giving much away to say that she’s much more than what she appears, since we learn in the first page of the issue that she’s romanced several of the agency’s top agents without any of them knowing she was playing the field. When one of their agents is killed, she ends up in the middle of the investigation, and we see that she’s really not what she appears to be. It’s a wonderful set-up issue. It takes place in 1973, perhaps coincidentally the year that Roger Moore took over as James Bond in the film series, and a few years after The Prisoner. But I suspect Brubaker is mainly going for the period atmosphere and is working from a wider assortment of source material. (The afterword by Jess Nevins cover the history of spy fiction, almost none of which I’ve read, so I can happily enjoy the series without worrying about most hidden references that have been dropped in.) The time period is also one in which there were very few woman agents (the ones from The Avengers and…? ), which could lead to some exploration of gender issues, if Brubaker decides to play it that way. I’m more interested in how Velvet managed to end up in her position given her obvious qualifications for other lines of work, and presumably that will be at least the subject of the first arc, if not of the whole series. But this being a Brubaker series, there are surely plenty of other characters who have interesting dirty laundry to be aired. It looks great. I can’t wait.